More and more parents of children less than 3 years of age attend a dental practice because they are aware of the need for early and regular dental and medical care in equal measure. In addition to the child's oral care, questions regarding eating and drinking habits, breastfeeding, bottle feeding and pacifiers are the main focus of interest. The dental team are therefore required to give parents expert information on the subject of pacifiers and provide support until the weaning stage. In the case in question, a 39-year-old patient was referred to my practice by his orthodontist for conservative composite treatment of tooth 12 (upper right lateral incisor) following levelling of the teeth. 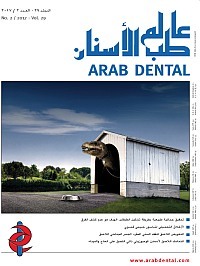 The aim was to achieve better symmetry in the dental arch. The asymmetry existed in both the gingival region and tooth 12 itself. The gingival asymmetry was not as much of a problem to the patient as the shorter tooth, which also appeared more discoloured. The patient's teeth were healthy and free from caries. We therefore began the treatment with a two-week whitening cycle consisting of customised trays with 10% carbamide peroxide, worn overnight. This resulted in a shade improvement for his maxillary anterior teeth from 2M1/3M1 to Vita 0M3 with cervical hints of 1M1. Jauernik, J. / Stadlinger, B. / Rücker, M. / Damerau, G.
Oroantral communication occurs especially when upper posterior teeth are extracted. Provided there is no infection, immediate plastic surgical closure of the recently opened maxillary sinus is possible, observing a time window of 24 hours. When the sinus opening has been present longer, this is called an oroantral fistula, primary treatment of which is conservative. Secondary management consists of local revision and plastic surgical closure. This case report describes covering of a sinus opening in the right maxilla of a 63-year old patient by a Rehrmann flap in a two-stage procedure. Clinical observations, as well as deep venous thrombosis (DVT) evaluations and three-dimensional model analyses showed that the alveolar structures can be preserved almost completely by replantation, especially the buccal lamella, which is usually resorbed. Extrusion of the segments induces vertical tissue apposition. The 3D model analyses show that the alveolar soft and hard tissue structures will largely be preserved by the replanted root segments. Bothung, C. / Schiffer, H.
Aesthetic and functional requirements involved in the rehabilitation of anterior single- tooth gaps (e.g. in the case of agenesia or traumatic tooth loss) can be met using different treatment concepts. Treatment of a 17-year-old female patient using two single-wing, resin-bonded bridges is presented in the following and the practical implementation discussed in detail using a case example.